We spent 6 days in the Grand Canyon with our guides Ronnie, Jeff, Newdey and Kiefer from Western River Expeditions on two boats. This is the trip of a lifetime folks, you won't have any regrets. The J-rig boats are large and comfortable and easy to move around. You can sit up front and get splashed and then move to the back to warm up. The 6 day trip took us 188 miles and over 60+ rapids. Each day you have to help unload the boat and setup your tent and cots and then take them down in the morning. If you don't like to camp, you won't like this but hey no one goes to the Grand Canyon for a spa experience. You will be unplugged and out of cell phone range for the whole time and this was a gift beyond measure. Ronnie and Jeff were full of stories of the canyon, it's geology, those that explored it in the 19th century, and it's wild life. They told us on day one that we were going on an expedition and they didn't disappoint. Each night they cooked us an amazing meal and you really won't believe what they are able to whip up with limited resources. 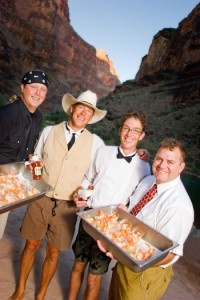 Imagine having shrimp cocktail delivered to your tent with your guides dressed in coats and tails and you get the picture. These people really go the extra mile. Our group consisted of 15 family members, but there were other groups from all over including the UK. Lots of fun. At the end they send you out of the canyon via helicopter. Don't settle for one of those day trip rides over the canyon, jump in and live it for a week you won't be disappointed.